My video parody of Rick Perry's "Strong" campaign ad on YouTube has been attracting a lot of attention with about 4,500 likes and under 100 dislikes, including close to 650 comments. It has been featured in USA Today, Daily Kos, Jewish Journal, JTA, Forward, Jewcy, and Spiegel Online (German). There have been many video parodies of Rick Perry's campaign ad turning it into a meme on the Web. But I've noticed that the best way to mock Rick Perry and his homophobic, "war on religion"-paranoid message is to do nothing. The video mocks itself. When I was choosing the background music for my video parody with the video's editor Adam Luger we tried to come as close as possible to the background music in the original Rick Perry commercial. However, we were unable to determine who composed the music. Well, it now appears that the joke's on Rick Perry because that background music was inspired by none other than Aaron Copland. Jewish? Check! Gay? Flaming! Member of the Communist Party? You betcha! 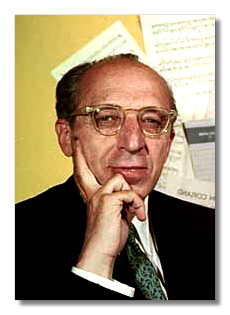 Paul Schied writing in the Harvard Political Review first reported that the music heard in the background of Rick Perry's "Strong" ad was composed by Aaron Copland, a prominent composer who was Jewish, outwardly gay, and a member of the Communist Party. It turns out that Schied's music majoring roommate detected the Copland composed music. It turns out that the music was inspired by Aaron Copland, but is actually a "cheap knock-off of sorts of Copland's Appalachian Spring according to The New Yorker music critic Alex Ross." The background music in Rick Perry's ad was inspired by composer Aaron Copland who was gay. So, for those of you keeping score at home, Rick Perry's campaign ad (which was originally created for the Iowa television market but quickly went viral on YouTube) has him proclaiming that it's wrong for gays to serve openly in the military when kids can't celebrate Christmas in school, but has him wearing a jacket that looks like the one worn by Heath Ledger in the gay romance movie "Brokeback Mountain" and features background music inspired by a gay, Jewish composer. You just can't make this stuff up! Gee, Rabbi, I hope you do not mind my blog entry that linked to your blog entry Response to Rick Perry's Campaign Ad. Thank you for your brilliant send-up of that schmuck Rick Perry. "That's just uncomfortable." Hah! Rabbi Jason, THANK YOU for your Rick Perry parady of his horrible "Strong" video. I appreciated everything you shared. Many of my friends and I were horrified by Perry's video but were relieved to see a voice of reason, of intelligence. I like your parody on Rick Perry! Keep up the good work! I love you parody of Ricky Perrys.You are better than all republican candidates.